Rita Hayworth and Fred Astaire in You Were Never Lovelier. 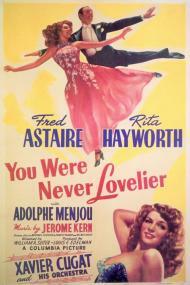 You Were Never Lovelier is the second and final teaming of Fred Astaire and Rita Hayworth. Unfortunately they would never make a color film together. Yet, even in black and white these two luminous stars make for a bright piece of celluloid entertainment. Fred Astaire plays famous Broadway dancer Robert Davis. He finds himself penniless in Argentina after losing at the track. Robert tries to get a job dancing at a hotel owned by Eduardo Acuña (Adolphe Menjou). Eduardo is too busy trying to marry off his daughters to even give Robert an audition. Lucky for Robert, his old friend Xavier Cugat is the orchestra leader at the hotel and arranges for Robert to sing as his orchestra plays at Acuña's oldest daughter's wedding. The plan being that Eduardo will hear Robert sing and then offer him a job. Robert sings "Dearly Beloved," but the plan does not work. However, Robert meets the beautiful Maria (Rita Hayworth) who gives him the cold shoulder. Robert tells Eduardo, whom he doesn't realize is Maria's father, "Her personality is like the inside of a refrigerator." Maria has two younger sisters. Each are secretly engaged. The tradition of the family is that each girl must get married in order of birth. Maria is next but she is not interested in any of the men she knows. Eduardo starts sending Maria orchids and love letters signing them from a secret admirer. His plan is to stir her romantically then set her up with a suitor of his choice. Robert, still attempting to get a job accidentally delivers an orchid. Maria assumes he is her secret admirer. Eduardo does not like the pushy New York dancer and objects. However, he can't say anything or Maria will know that her father has gotten her all worked up over nothing. Robert finally strikes a deal with Eduardo. Robert gets a job dancing at the hotel if he promises not to tell Maria the truth, and break up with her. Robert and Maria soon get to know each other. They dance "The Shorty George" together and - much to Eduardo's dismay - fall in love. Eduardo's secret love letters continue to get him into trouble as his wife finds them and assumes her husband is having an affair. This is a musical comedy, so you just know it will all turn out in the end. This is a delightful romp of a movie. It is wonderfully comedic. Eduardo's hapless male secretary steals many scenes. Astaire and Hayworth grace the screen in a way that only they can. "Dearly Beloved" was nominated for an Academy Award for "Best Song." As long as you can get past the slightly silly plot you will thoroughly enjoy You Were Never Lovelier. 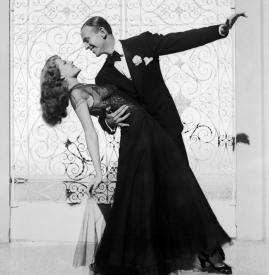 Rita Hayworth and Fred Astaire personify class and elegance in movement. You Were Never Lovelier is an amusing little romantic, musical-comedy featuring two great stars at the peaks of their talent. The plot is, in essence, an Astaire/Rogers musical with Rita Hayworth stepping in for Ginger. Like nearly all of Fred Astaire’s movies with Ginger Rogers he plays a song and dance man, they meet and initially don’t like each other, there is some sort of mistaken identity that happens, they dance together and fall in love, then in the final act some sort of obstacle to their being together must be overcome before the happily ever after ending. It’s a simple formula but one that definitely works. The plot is silly but the script is funny enough and the cast of supporting players talented enough to keep things humming along. Adolphe Menjou was a master at playing sophisticated, sarcastic men. He had been in the picture business since 1914 and would continue making movies until 1960. He brought gravitas to the many father parts he played at this time in his career. Latin-American flavored music was all the rage in 1940’s Hollywood. Xavier Cugat and His Orchestra provide the zesty rhythm. Eric, you mentioned the “Shorty George” number and it is a great dance routine. 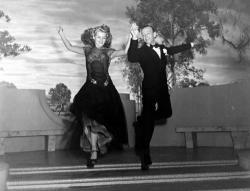 But my favorite song and dance in the movie is “I’m Old Fashioned” which finds Fred and Rita dancing a graceful duet around a moonlit terrace and garden. It is not only the best number from this movie; it is one of the all-time great romantic dances ever to grace the screen. I agree Eric, You Were Never Lovelier is a delightful romp of a movie. This movie helped explain a 37 year old joke to me. In McLean Stevenson's final episode of M*A*S*H, Hawkeye, Trapper and Radar have a suit made for him by a local tailor. When he puts it on, Trapper says, “Henry that suit is you.” And Hawkeye adds under his breath, “If you're Adolphe Menjou.” It's a duplicate to the pinstripe suit that Menjou wears in this movie. Eric has often said that there's something unique about watching old black & white movies late at night and that was when I watched this one. I'm sure that I would have enjoyed it had I watched it in broad daylight, but there was something special about watching it in the dark like an old fashioned Late Movie. As my brothers said, the plot is silly and light. Am I the only one who found it odd though, that a father was writing passionate love letters to his own daughter? I know that he wasn't writing them to her in that way, but still, he was writing them to stir her passions and he succeeds. It's only a minor point and has no serious connotations, but it still seemed a strange plot device. I agree that Fernando, the male secretary steals many scenes, but so does Barbara Brown as Delfina, Rita Hayworth's mother. By the time she nearly shoots Astaire's character with the lighter pistol, the comedy approaches screwball level. The desperate to get married sisters also provide some laughs. Hayworth and Astaire make a great couple. There was no one more beautiful than her in the 1940s and she truly lives up to the nickname “Love Goddess” here. Astaire, of course, was grace and style in human form. Sure, he was quite a bit older than her, but when they dance you'd never know it. And oh what dancing. 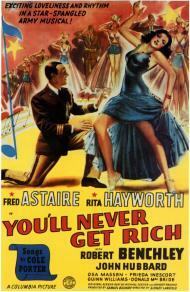 The cast and comedy is great, but when Astaire takes Hayworth in his arms, they make movie magic. I agree with Patrick that the “I'm Old Fashioned” number is cinematic romance personified. As they twirl with elegance and grace around the garden in the moonlight, you can't help but be caught up in the moment. It raises this silly little comedy up to something greater than itself.